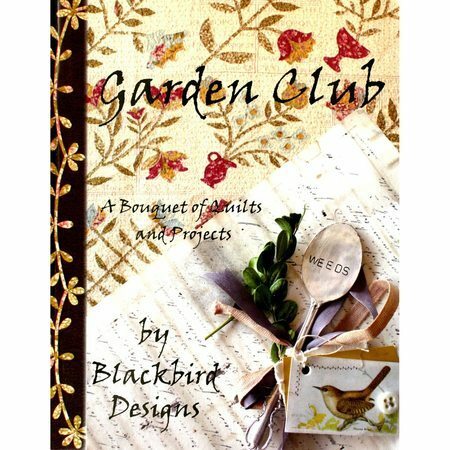 In Garden Club by Barbara Adams and Alma Allen from Blackbird Designs they invite you to attend a few meetings of the Polk Garden Club. You'll get to show off your home and garden, share a few seedlings, and get some tips on pruning your roses. Relax, sit down, and meet other members of the club as you stitch the blocks from Barb's version of the quilt, Pressed Flowers, or choose Alma's version, Garden Fair. Garden Club offers a variety of blooms ready to be picked. Stitch the wool Garden Basket pennymat, brighten your home with the Winter Apple table quilt, or cross stitch a sampler or pinkeep. You'll love this bouquet of projects waiting for you to begin and best of all the leaves never fall and the flowers never droop.